The result is a portfolio of prints that are diverse in image and that embrace and celebrate the tradition and the alternative in printmaking techniques found in lithography, intaglio, woodcut, silkscreen, archival pigment, hybrid, intaglio types, and photo-relief prints. This portfolio celebrates these artists as innovators for their continued development of the printmaking medium and their own unique artistic visions as evidenced by their work and continued success as educators. 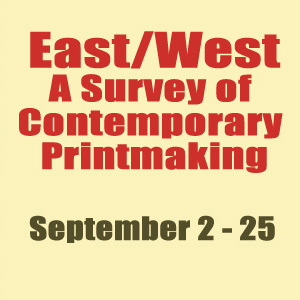 These printmakers have had and continue to have dramatic impacts on printmaking education, their institutions and printmaking workshops. This portfolio was organized by Professor Brian Kelly of the University of Louisianna at Lafayette. Presented in collaboration with the College of the Sequoias Art Gallery, half of the portfolio is on display at Arts Visalia and half at College of the Sequoias. The exhibition will be on display from September 2nd through September 25th with an opening reception on the evening of Friday, September 4th from 6:00 to 8:00 pm. Admission is free and open to the public. the City of Visalia Community Arts Grants program.